The best part about our business is talking to our customers! We invite you to take this Frequently Asked Questions page as the beginning of a conversation to come. To start, we’ve tried to answer for you here just some of the questions customers have asked over the years. Below, you’ll find our store sales and shipping policies. Betathane is part of the group of materials known asbioplastics and has become the standard for many harnesses and related products. Betathane strapping has a thin interior webbing impregnated with synthetic material which looks and feels very much like leather. Mosot betathane is matte finish and grained to resemble leather. Betathane is seven times stronger than leather, is not affected by weather, does not absorb water, does not stretch, maintains its shape, and is easily cleaned with water or a damp cloth. It is extremely durable. As our most popular harness material, nearly all of the harness we sell is made of betathane. Some of our first betathane harness made in 1993 and 1994 is still in daily use and shows no sign of wearing out. Biothane is a thin webbing impregnated with synthetic materials, in the class of bioplastics as is betathane. Biothane has the same excellent qualities as betathane, the primary difference is that the surface is of biothane strapping and sheeting is flat and shiny like patent leather. It is thinner and more plastic looking than Betathane. Biothane is somewhat more stiff than beta, and is frequently used in Draft horse show harness because of it’s showy finish, light weight, lack of maintenance required and durability. ...the advantage of using your unique Comfy Fit Carefree Harness? ...the standard measurement of each of your harness sizes? The following are basic measurements. To help decide the size you’ll need for your horse, we encourage you to use our handy-dandy measuring chart. Poll measurement is taken from corner of mouth, up over poll behind the ears, to corner of mouth on other side. Girth measurement is taken right behind the front legs, all the way around. Mini A, B, C, and Pony have 1/2″ Neck and Hip Straps, and 1″ traces. Mini C is a Chimacum Tack special size designed to fit mini’s who are a bit big for a Mini B and a bit small for a Pony size. Large Pony has 5/8″ Neck and Hip straps, and 1″ traces. We can make any size you need, with any strapping you desire – both width and color. Many sizes and styles are in stock. However, we don’t stock draft parts or harnesses. Please allow lead time for draft harness products. If you have special needs or questions, please give us a call and we’ll be glad to take care of your order as quickly as possible. We make harness for all sorts of animals and functions. 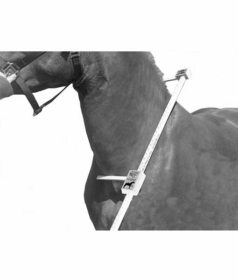 Measure from the corner of the horse’s mouth on one side, over the poll (behind the ears) to the corner of the horse’s mouth on the other side. This is called the poll measurement. Measure from temple to temple across the horse’s brow. This is called the browband measurement. Measure all the way around the horse’s nose approximately 2 fingers below the tear bones (located about midway down the horse’s face). This is the location for a cavason. The measurement is called the Noseband measurement. Bridle measurements for various sizes are included with the products. If you have a bit which fits your horse, measure the mouthpiece from inside the cheek on one side to the inside of the cheek on the other. If you need to start from scratch, use a smooth straight stick, ruler or dowel and place it in the horse’s mouth as if it were a bit. Then mark the stick with a marker or pen at the outside of the lip. Once you remove the stick from the mouth, simply measure between your marks with a measuring tape or ruler. 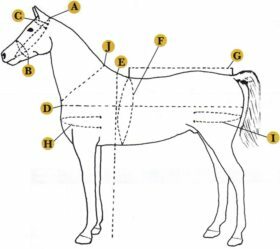 To get the best fit measure from the center of the chest, along the side of the horse in a straight line, to the center of the tail. When ordering, round up to the next higher inch. Also have a look at your horse’s neck to decide if a standard contour neck will work for your horse or if you need a cutback neck. Illustrations are with the products offering that option. For draft horses it is sometimes helpful to measure the drop (from the center of the back to where the blanket edge should be on the horse) It is also useful to measure the drop for Donkeys and Mules and Mini Donkeys and Mules. For LOTS more on Blankets, see the dedicated section on this page, below. ...Collar size and how to fit a collar? It does not matter how well a horse collar is made, if it is not properly fitted to the horse it is sure to hurt him. It is therefore necessary to use the greatest care in selecting the proper shape and size collar for your animal. To measure your animal for a collar, use a collar measure as shown, or make one from carpenter’s squares or cut one from cardboard. Place this caliper as shown. The collar measurement requires a straight line thru the center of the horses neck. To measure a Collar, not the animal, place a ruler against the collar cap and measure to the inside brim of the throat as illustrated right. It is easily done if you lay the collar on a flat surface and measure with a tape measure inside the rim from top to bottom. For size of draft, measure around the collar at the widest part, of one side near the bottom. When fitting a horse with a collar there should not be any more space between the horse’s neck and the throat of the collar than will allow your four fingers, when laid flat on the inside of the throat of the collar, to pass freely. If care is taken in fitting the collar and adjusting the hames so the hame tug comes over the center of the draft, you will have eliminated all trouble with sore necks and shoulders and the horse will work with ease and comfort. More collared horses are ruined by collars which are fitted too large than from any other cause. The size of the hames is dependent on the size of the collar. Buggy hames are generally the same size as the collar and Work Hames (Farm Hames) are adjustable and vary based on the size of the collar. Farm hames can generally accommodate more than one size collar. Measuring for a harness is not difficult, but it is essential to getting a correct fit. See the following key and illustration below. A. From corner of mouth, over poll, to other corner of mouth. B. Length around nose, taken about two fingers width below the prominent cheek bone. C. Length of browband – temple to temple. D. Length of horse measured just on the side. Not center of chest to center of tail. E. Height of horse from lowest hair on mane to the ground. F. Girth – measured at the heart girth as shown. G. Length of back from position of harness saddle to base of tail. Line should be straight, not conforming to horse’s body. H. Point of shoulder to point of shoulder on the other side. I. Point of hip to the point of hip on the other side. ...I receive the wrong item? Oh, dear! We’re very sorry. If we have sent an incorrect item we will pay for both the return shipping costs, and ship you the correct item as soon as possible. Life does get in the way sometimes and we apologize for the hassle. If you inadvertently ordered the wrong item here on our website, just give us a call and we’ll sort it out together. It is fine for you to be human too. ...my custom ordered item doesn't fit? However, if you’ve measured twice and still somehow managed to receive an item that isn’t quite right, we’ll work with you to make sure you’re happy. Just give us a call. ...I want to return an item? We accept returns of like new in-stock merchandise within 30 days of purchase unless other arrangements have been made. Like new condition means you can surely try the product on and be sure it fits and you are happy with it. If for some reason you need to return it or exchange it for a different size, etc. It is important for you to be sure it is clean! And parts put together as they were when you received the item. Returned parts that are dirty have to be sold as used parts. We are glad to always guarantee sizes, your job is to return clean parts to us for exchange. Thanks. There is two exceptions, you’ve specially ordered tack with brass hardware is not returnable, we simply do not have enough demand for brass hardware to accept returns of brass – special-order items. We will try always to let you know brass is not returnable but even if you don’t remember that it is not returnable, we will remember! Colored strap goods are not returnable as well. You may have asked for a purple kick strap but it will not resell quickly. Please see the following question about returning custom-ordered items. ...I want to return custom/special order item? 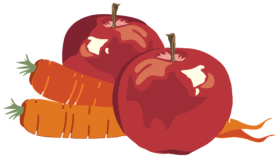 Special order items are generally not returnable. However if you receive a special order item and wish to return or change it a bit please call Janie to talk about what options may be available. We built our business on old fashioned personal customer service and we always try to treat customers as well as we would members of our immediate family. Rarely have we been unable to solve any problem that arose. Thanks. ...I need a replacement part but don't know what it's called? Harnesses are made up of dozens of parts, all with unique names. But that’s not a problem – here are a couple of handy chart to help you out, and if you’re still wondering what you need and how to get it, just call! ...I drive a Goat? Or a Zebra? Or a Donkey? Or a Cow? Or a Dog? How cool! Can we see pictures!? Your special equine/capra/bovine/canine needs a special harness, and we’ll do our best to get you what we need. Since we work with a very special harness maker, we are able to get some really fun custom orders taken care of. Like this pair harness we made for some sweet goats up in Northwestern Washington State: Goatorama! If you need a custom harness, simply use our hand-dandy measuring tool, take your furry friend’s measurements, and then give us a call! ...decide which harness is right for me? We’re so glad you asked! Harness is our favorite thing to talk about, and if you spend time looking around our site and our blog you’ll learn all you need to know to make your decision. We have worked for decades with experts, trainers, show judges, and hobby-drivers, and we’ve learned a lot about how to help you choose your harness. Feel free to call or e-mail with any questions. We answer from about 8am to 8pm pacific time every day. We specially designed our Comfy Fit harness to meet the needs of most of our pleasure and sport driving customers. Traditional pleasure harness is often the most appropriate for casual and/or occasional drivers. You may need farm harness, parade harness, logging or pulling harness, or even training harness, Perhaps you might be a Hollywood studio looking for a custom Emerald harness for a movie, such as the one we made for the “Oz the Great and Powerful.”, or a museum needing replica harness for a display. Here’s a little short summary of each of our full harness products, to help you choose. Mini thru draft sizes including special sizes for mini donkeys and mules. Traditional pleasure harness is styled the same way it has been for at least 200+ years. The breast collar style features a straight breast strap that is one long unit from trace connector slot, around the front of the animal to the trace connector slot on the other side. Traditional pleasure harness has a well padded saddle (without a tree) and s simple bridle with blinds and winker stays – typically with square blinds for horses, pigeon wing blinds for donkeys and mules. Cruppers are soft folded leather made in such a way that nothing can rub on the sensitive skin on the underside of your horse’s tail. Hardware can be stainless or brass although we make brass harness as special order and do not take it back. Traditional pleasure harness is available in single or pair. Standard, deluxe or super deluxe styles. Comfy Fit Harness has several features differentiating it from Traditional harness. Comfy fit Breastcollars are available in three styles, V curved, Deluxe (to allow more shoulder movement), and the Comfy Collar which is in essence a combination of a neck collar and a deluxe breastcollar. Each collar style is designed to minimize airway constriction and ensure free movement. There is also a specially designed breastcollar just for mini donkeys and mules. Comfy Fit Breastcollars, breechings, saddles, neck straps are well padded.and adjustable. Comfy fit saddles have an aluminum tree which is strong, light and semi adjustable. This gig type saddle is wrapped and padded with padding extending down the sides of the equine. Saddles are available with standard shaft loops, quick release shaft loops or sliding backbands. Comfy Fit Bridles feature a curved crown piece to avoid irritating ears, an integrated noseband to keep the bridle stable on the animal, nicely shaped curved blinds and your choice of browband ornaments. Cruppers are soft, folded leather made in such a way that nothing can rub the sensitive skin on your horse’s tail. Comfy fit harness is available in all sizes as single, pair or other multiple configuration. Adaptive Walking Harness – designed individually for people using their VSE for walking assistance. Micro Mini Harness – traditional and comfy fit styles is designed specifically for the under 30″ crowd and is increasingly popular. Mini thru draft sizes for horses, mules and donkeys. Single or Team or other multiple configuration. Several styles other than the standard farm style: i.e. hip style breeching, New England Side backer or logging/plow harness. Extra heavy pulling harness for competition from pony thru large draft sizes. Work harness is available in nylon or betathane. Work harness can be spotted with round or diamond spots, full or medium spots. Work harness is proportioned for your animal and heavily built for extensive use. Single, Team or other multiple configuration. Features include three strap fancy breeching spider, hip drops and face ornaments as well as tie straps, . Work harness is available in betathane (matte finish) or Bioplastic (shiny, patent look finish). Parade harness can be spotted with round or diamond spots, full or medium spots. Parade harness is proportioned for your animal and well built for extensive use. And of course, if you have questions or want our input, feel free to call us! Janie is always happy to help. 360-301-1317. She answers the phone from 8am to 8pm pacific generally every day. If you don’t reach her, she will get back to you. ...decide which collar to use? Different types of work or vehicles require different style neck collars. Please note: All our collars are handmade using traditional methods, and may differ slightly from images on this site. All are of the highest quality and craftsmanship. Full Sweeny (FS) are for heavy and “stud like” necks, where the neck is extremely thick at the upper part of the neck. Half Sweeny (HS) fits necks that are side and thick at the upper part of the neck. Most Draft Horses use HS. Full Face (FF) or straight collars fits flat and slender necks. Most buggy horses use FF. Mule Collars have very straight sides and are available by special order. When should I blanket my horse? The simple answer is that horses need blankets when they are cold or wet and are not able to generate enough body heat to stay comfortable on their own. A young healthy horse with a good diet and plenty of time outside in the fresh air, in different sorts of weather and getting plenty of exercise, will grow his own blanket. His hair coat is well designed to keep him warm and dry. He has two types of hair, a soft undercoat to trap body heat and longer outer hairs which are designed to shed water. If he can keep out of the wind and rain your horse shouldn’t need a blanket. However, if he’s wet, or thin, ill, or in a windy, rainy area without protection he may well need one. Horses who are blanketed during the summer or fall to keep them clean, to reduce sweating, shorten cooling out time or hasten drying after bathing or exercise, or for other reasons, often have decreased hair growth and need to be blanketed thru the year. Clipped horses generally need blankets or sheets year round especially at night depending on their environment, their feed, and their activity level even in warmer climates. Horses which are shown extensively spend a good deal of time clipped and dressed in sweats, neck wraps, hoods and sheets or blankets. Often in a show barn at night you’ll find horses with more than one layer if the temperature is cooler than normal. Once the show season is over it may take a little time for the hair coat to re-grow and the horse’s internal temperature regulation systems to function independently again. The important thing is to pay attention to your horse and see if he is comfortable. Horses which have been recently relocated may need to be blanketed for their first winter if their new home climate is significantly different than their former one. For example, a horse from a southern climate may be very chilly in the north until his body learns how much hair to grow. A horse in a dry climate who moves to a damper climate may be cold as well until s/her becomes acclimated. Should I leave a blanket on my horse all the time once I put one on? No. It is important to take the blanket off frequently to check for spots where it may be rubbing and might cause sores or other problems, such as flaky skin or rashes, and to brush the horse to stimulate circulation and remove dirt and dead skin. It is also a good idea to leave the blanket off when possible to allow the horse’s skin to breathe. Take if off during the day whenever possible to take advantage of the fresh air. How will I know if my horse is cold? Remember that horses are meant to live outside. They are designed to function well in colder weather if they are healthy and well fed. You can tell if he’s chilled if he is shivering. He may have “goose bumps” with his hair standing on end or stand stiffly with his tail clamped against his body. He may feel cold to you when you feel his face, ears, or in his “armpit”. He may just look unhappy and be standing with his tail tucked tightly against his body. How will I know if my horse if too warm? Look to see if he’s sweating. If he’s blanketed look first under the blanket then along the neck and behind the ears. As the temperature rises to the mid 50s during the day horses in turnout rugs are likely to sweat which then turns clammy and cool under their blankets unless they are breathable. On days of significant temperature changes it is always better to have less clothing. Horses can raise their temperature by moving around, standing in a sheltered spot, but if they are blanketed their only option for cooling is to sweat. Does my feeding program impact keeping my horse comfortable in colder weather? Absolutely. Your feeding program is crucial to your horse’s health and the ability of his body to regulate itself. As the weather becomes colder your horse needs more calories to generate body heat. More calories required more hay! Make sure your horse is getting enough grazing in addition to their morning and evening feeding. There are also a number of other options to consider for increasing calories within the guidelines for good equine nutrition. Talk with your vet about adding Beet pulp or corn oil to the diet if you are in a cold area or if your horse seems to need more calories to keep warm. How do I measure for a horse blanket? The most important measurement to take into account is the length of the blanket required. This is measured as the distance from the center of the chest to center of the tail. Some brands have different measuring instructions based on their design differences, so be sure to ask before buying a blanket. It is also important to consider the build of your horse. A horse with a very big or stocky build will more than likely require a blanket larger than his length would indicate. Similarly, a finely built horse may require a size smaller. A turnout blanket will be shaped differently than a stable blanket and will fit differently. Be sure to consider the overall shape of the horse in choosing apparel! Most blankets are sized in two-inch or three-inch increments. Blanket depth can also be a real issue for many horse owners. For example a 48” blanket could be needed for a mini horse, a mini donkey or a Shetland. The difference in depth for those three animals could be as much as 8-12 inches. One 48” is not the same as another. How can I tell if my horse blanket fits? There are several places that you should check to be sure that your blanket fits your horse well. The withers – Be sure that the blanket fits well up the neck and beyond the withers – to ensure that excessive pressure is not put either on the point of shoulder or directly on or behind the wither. A well-fitting blanket should lay 2-4 inches in front of the withers. Different equine builds fit well with different styles and brands of blankets. Once you’ve put the blanket on the horse notice the way it lies on the horse’s neck as s/he moves. The shoulders – Be sure the outside edge of the blanket is well in front of the shoulder to allow for free movement. Proper fit at the neck and shoulder are both essential. With a well fitting blanket, the top strap of the front fastening should be about in line with the point of shoulder. If this strap lies much above the point of shoulder, your horse’s freedom to graze will be restricted. If the strap lies much below the point of shoulder, undue pressure will be put on his shoulders, which may cause rubbing. Check the overlap in the front to be sure that the two sides will remain in place as the horse grazes, walks, rolls, sleeps. If the overlap is insufficient the blanket will shift forward or back and/or bunch up causing rubbing. Be sure to look carefully at the front closure system. There are a wide variety of options on blankets of different brands. Think about your horse’s shape as you evaluate the best closure for your purchase. The rump – 3 to 5 darts (depending on the type of the blanket) should be in place around the rear of the blanket to facilitate a snug fit over the rump. The end of the blanket, where the tail flap is attached, should finish just as the tail starts. Be sure that the fillet string is attached and fitted under the horse’s tail on all Turnout blankets. This is designed to ensure that the back of the blanket is not blown forward in severe wind. A strong gust of wind could put the back end of your horse’s blanket up around his back and neck causing irritation or distress. Should the fillet string break, be sure to replace it as soon as possible. Some have questioned the need for the filet string. However, if you’ve had a horse blanket go sideways in a storm and frighten your horse you’ll agree that it’s important to keep the filet string in place! The belly – the blanket should be cut deep enough so that the belly is not visible under the blanket! Blankets come in a wide variety of styles but it is important in all cases for the blanket to be deep enough to curve under the belly to provide protection from wind and wet. Be sure to measure your horse from the center of the spine around the side and down as far as your blanket needs to cover. When shopping for a blanket be sure to measure the blankets you are considering to be sure they are close to the measurement you need. How do I choose the right type and style of blanket? Type: Select your blanket style based on the housing/stabling conditions for your horse. Is s/he primarily inside during colder, wetter weather? Does s/he have a shelter with free access? Is s/he protected from rain? There are two general types of blankets. A stable blanket is generally thick and very warm, designed for maximum comfort and warmth rather than maneuverability. They are most often used when the horse is stabled inside. They are generally not water repellant or waterproof. Turnout rugs and blankets are built to be a little more durable than stable blankets, and are meant to stay in place during outdoor activity. Turnout rugs are generally tougher and more water repellant or waterproof than stable rugs. In many climates it is important to search for a turn-out blanket that is fully waterproof and breathable. Liners are also an option with several blanket manufacturers. You may want to consider a waterproof turnout sheet with a quilted or polar fleece liner as an option for very inclement weather. Weight: Weight refers to the insulating quality of the blanket, not its’ actual weight. The insulating materials in the blanket provide a range of protection. The blanket weight you should use on your horse will depend on your climate, the length of your horse’s hair coat, your horse’s metabolism, activity level, type and amount of feed, and the barn temperature and draftiness. Shape: Quarter horse style blankets are cut to fit closely. They tend to be shaped to curve under the belly and stay tucked up out of the way of the legs. European style blankets tend to be cut longer, extending well below the belly on the side. Neck: There are several styles of neck cut. Standard necks are cut for horses with narrower chests. Contour style necks are designed for horses with broader chests and higher withers. Cut back necks are cut to fit horses with large chests and heavy shoulders – i.e. Draft Horses. Closures: Open front blankets are closed with adjustable straps and provide adjustability and variable fit at the neck. Closed front blankets are joined in the front and do not offer adjustability. They work well if the neck fits properly on the horse without adjustment. Straps: Some blankets offer crossed -surcingles which provide a simple, effective non-slip design. The cross surcingles should be fitted so that they hang comfortably under the horse’s belly. If they are fitted too tight, undue strain will be put on the blanket. If fitted too loose, the ability of the blanket to remain secure may be compromised. Advocates claim these blankets eliminate the need for leg straps and the risks associated with them. Other blankets maintain the stability of the blanket on the horse by means of leg straps which hold the blanket in place on the rear of the horse, prevent it from shifting while the horse is lying down, etc. It is important to fit the leg straps with care so that they stay close to the horse’s belly and do not allow a foot to get caught up in the strap. Stable Blankets: When machine washing blankets, follow the care instructions that came with the blanket or are attached to the blanket. Most stable blankets can be machine washed on warm wash and cold rinse cycle if you have a large front load washing machine. Some Laundromats allows horse blankets to be washed or provide a laundering service. Most stable blankets should not be dry cleaned Mild soap should be used and multiple rinses to ensure that there is no residue left after rinsing. When possible wash twice, rinse twice. When the wash cycle is complete, you can fluff the blanket in a dryer on LOW for about 5 minutes. Then hang the blankets on a blanket rack in a warm (50-60F) area. If you hang them right side out for a few hours and then turn them inside out, they should be ready to use in a day. Turn Out Blankets: Your turnout blanket will last longer and be more comfortable for your horse if it is cleaned and maintained properly. One thorough annual cleaning after the winter season may be sufficient, before the blanket is put away for the summer. However in really wet or muddy areas you may need to launder the turnout blankets more frequently to prevent skin problems. Wash with mild detergent and cool water. High temperatures and harsh detergents will compromise the waterproofing of your turnout blanket. It is therefore vital that the following guidelines are strictly followed. Many blankets are now made with fibers coated with Teflon. These are extremely waterproof, but cannot be put in the dryer AT ALL! Be sure to read the label on your blankets. Before laundering, remove excess dirt from the outside with a stiff brush or hose the blanket down. After washing, be sure the blanket is rinsed thoroughly, drip dry — do not tumble dry. We go out of our way to make sure your shopping experience with us is one that you’ll tell your friends and family about. If you are not completely satisfied with your purchase, contact us immediately and we will do our best to come to resolution, together. We accept returns of like new in-stock merchandise within 30 days of purchase. Please let us know by e-mail or phone that you wish to make a return. Some items will come to us in California, some to our harness shop in Missouri. Some items have specific packaging and/or instructions which will need to be returned in their original condition as well. A 15% restocking fee may be withheld from your refund on any merchandise returned without its original packaging. In most cases this is not a problem but some items do have specific packaging which we need to resell the items. If we have sent an incorrect item, we will pay for its return and ship the correct item as soon as possible. Items which have been custom made for you with brass hardware or colored strapping is not returnable. Be sure to measure twice! And call if you have any doubts about sizing or fit. Items which have been ordered specifically to fit your horse, such as collars, hames or other made to measure items, are not returnable unless we have made arrangements in advance. We are careful to verify sizes needed and request measurements so this is very seldom a problem. We frequently send sample items to try and fit. However we have had a few occasions where items were ordered against our advice and did not fit; We will not accept such items for a refund. We guarantee our harness to fit and will work with you to make sure that happens. Generally harness is just right when it arrives but if there are any fit problems just let us know which parts need to be exchanged for another size. If you are not pleased with an item purchased, for any reason, please let us know right away so that we may replace the item or offer a substitute. We strive for excellent customer service and would like to ensure that you receive from us products that are just right for your purposes and usage. We charge actual shipping costs, to the best of our ability. Our cart will tell you automatically whether your order qualifies for free shipping, or if you will be charged an estimated shipping at check out. Adjustments to the actual shipping costs will be made after we’ve processed your order, and we will let you know actual shipping costs and adjust your charge to reflect. Domestic shipping on most orders over $150 is now FREE! Exceptions include heavy or oversized items, such as eveners, heavy collars, and harness. International Shipping is calculated individually and an estimate will be provided to the customer prior to shipping. Chimacum Tack, including our online location here at www.chimacumtack.com and any of our sister urls and sites, is a retail company and as such makes no warranty and accepts no responsibility for the performance of any merchandise sold, other than warranted by the manufacturer. We will be happy to direct you to the manufacturers warranty information, upon request. Customers and users are entirely responsible for their own safety while using merchandise purchased from our company.